After hitting up Citywalk and Universal Studios, we took a day off from theme parks. 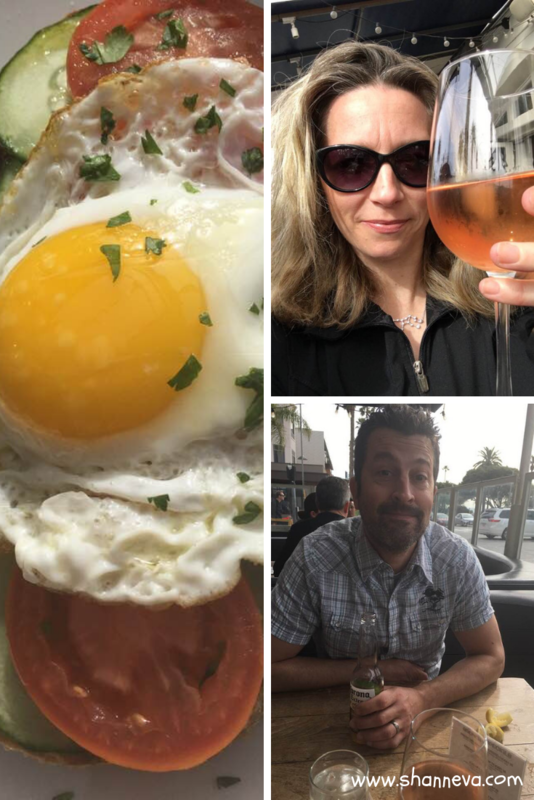 Starting in Studio City, we did a quick tour of Los Angeles and visited some must-see spots. 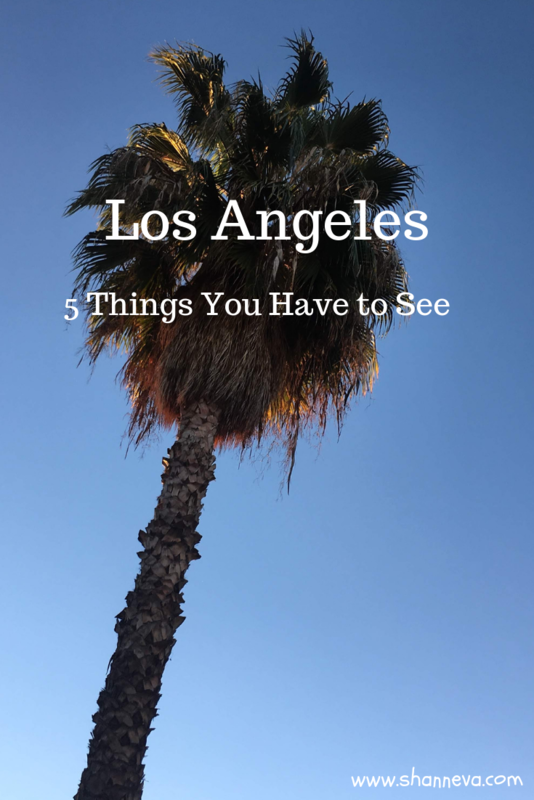 If you only have limited time in Los Angeles, this is the guide for you. Before we left the Valley (San Fernando, that is,) we stopped in my old neighborhood. Valley Village is the second place I lived after college. 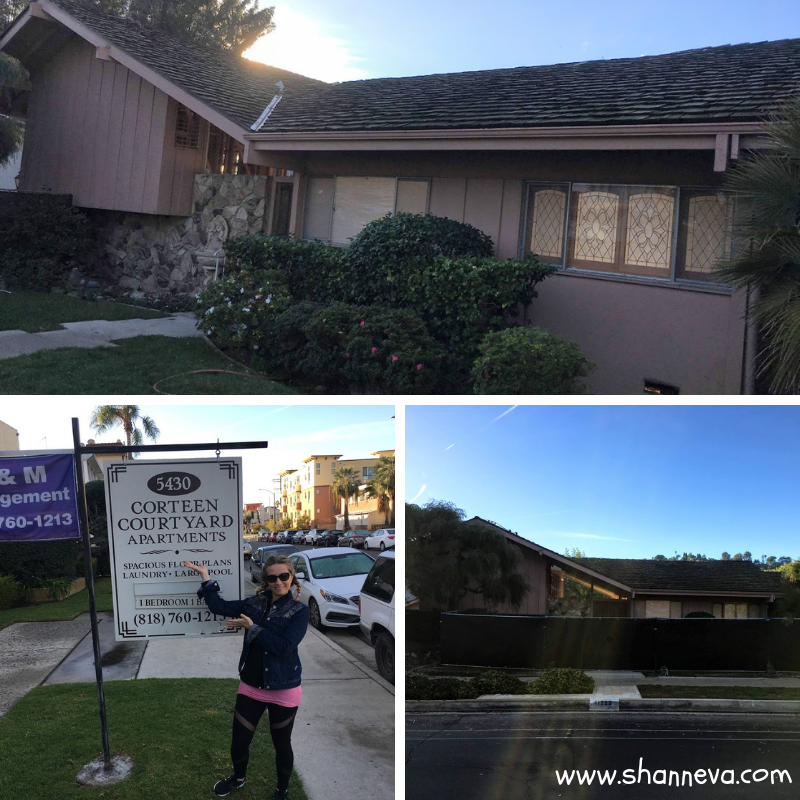 My husband also wanted to see the house that was used in the Brady Bunch, which we passed on the way. Unfortunately, we couldn’t get too close because they look like they are renovating it. He did get a picture, and then I got one in front of my old apartment building. We could have hopped on the freeway at that point, but I wanted to take the boys on the scenic route over Laurel Canyon. Even though it’s been many, many years, I still (sorta) remembered the way over into Hollywood. Although it looks magical on TV, the actual city of Hollywood isn’t the nicest area. It’s pretty rundown and dirty, but if you’re in the area, you just have to stop. We parked on a side street, and walked over to Grauman’s Chinese Theater and the Hollywood Walk of Fame. 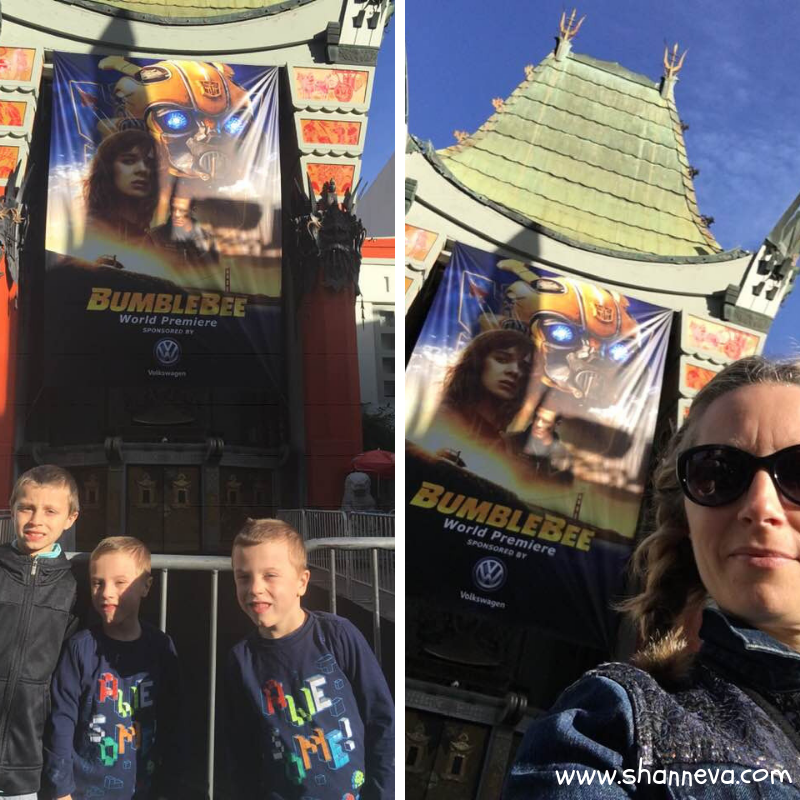 The premiere of the movie Bumblebee was happening later that night, so lots of the area was roped off. We still got a few pictures, saw some hand/footprints, and were accosted by weird costumed characters. These are definitely not the ones you want a picture with because they also want your money. It was then on to a spot where you can see the entire city. 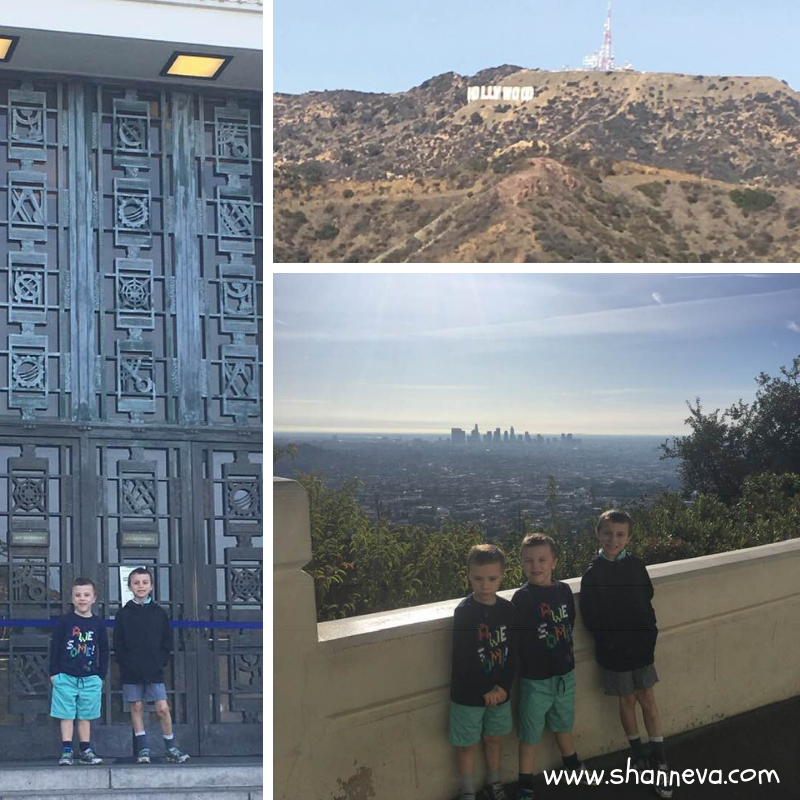 We took Sunset Boulevard and headed to the Griffith Observatory. It’s located in a beautiful public park, full of trails and look out points. You can even see the Hollywood Sign! We actually got there before the building opened, but we walked around and took in all the sights. It was really beautiful. The Observatory is free to visit, but you do have to plug the meters for parking once it is open. You can go in the building and look through the telescopes. I think it would be super fun to go at night for some stargazing or a show. However, the kids were hungry, so we headed towards the beach. Again, we took the scenic route by driving through Beverly Hills and West Hollywood. West Hollywood is a beautiful area, with artwork/landscape architecture in the medians on Santa Monica Boulevard. There are cute shops and restaurants too. 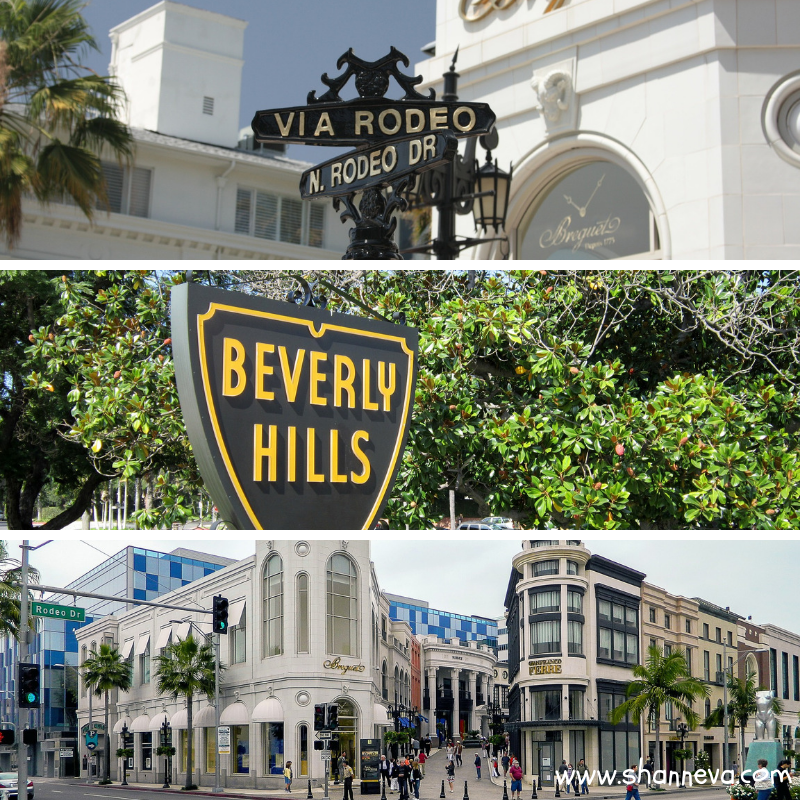 The boys marveled at the giant houses in Beverly Hills, and I drooled as we passed by Rodeo Drive. Yes, that’s the famed shopping area of Julia Robert’s character in Pretty Woman. There’s also a giant shopping mall called The Beverly Center that has every store you could ever want. If only my boys liked shopping as much as me! You can actually take Santa Monica Boulevard all the way to the beach. 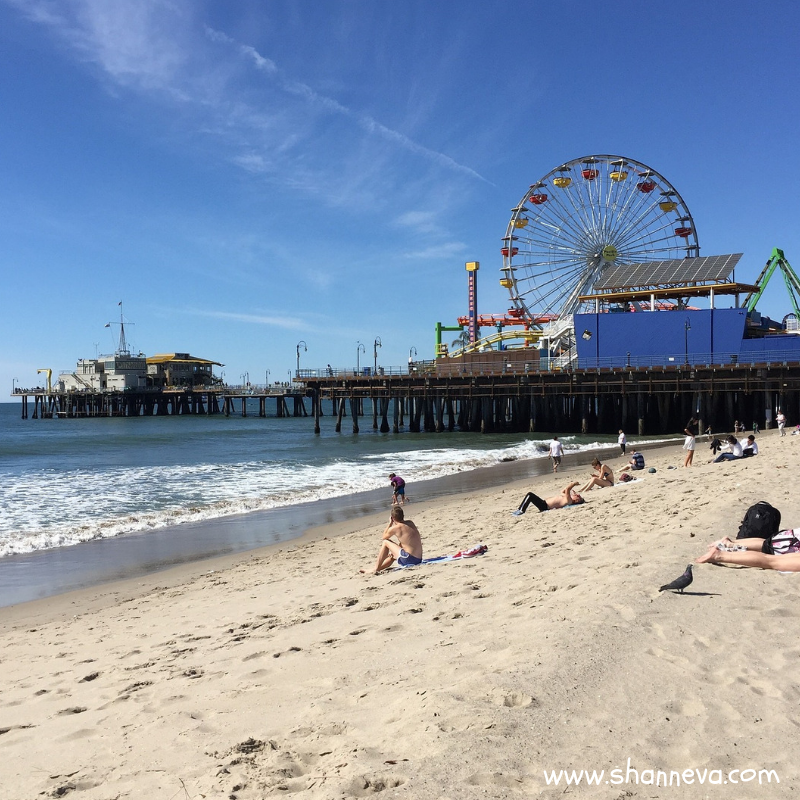 Both Venice Beach and Santa Monica Beach are close to each other, but we chose the later because of everything surrounding it, including Santa Monica Pier. We parked in a structure near the Third Street Promenade,which is an area filled with restaurants, shops, and entertainment. Plus, no cars allowed! We walked all the way to the end and ate lunch on a patio where we could see the Ocean. Then, the boys wanted to play on the beach. Even though it was too cold to swim, they collected shells, built sand castles, and waded in the water. There’s a pier with carnival rides, games, and food. 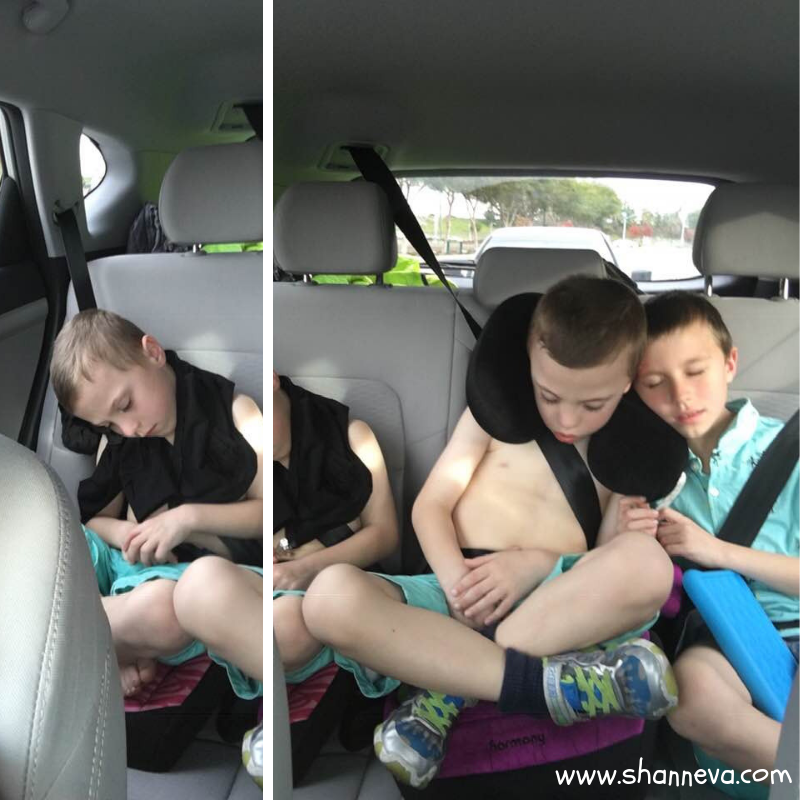 Unfortunately for the boys (but lucky for mom and dad!) the ride section was roped off for a private party. With sandy, tired boys, we headed off to Anaheim to begin the last leg of our trip…Disneyland! Have you ever been to Los Angeles? What’s your favorite spot? What a fun post! I’ve never been to LA despite having friends who moved there. You give a great preview of the place. Nice job. This looks like such a fun trip! I have never been to California and all your posts have really made me want to go! 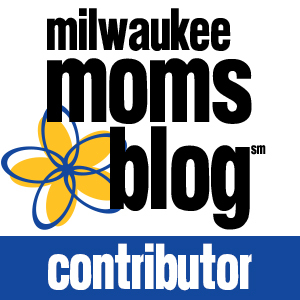 It seems pretty do-able with kiddos too, which is always something important to me! I think it’s cool you saw where you used to live too! Sounds like a super fun trip! I bet seeing your old apartment complex brought back some great memories. Looks like you all had a great holiday! 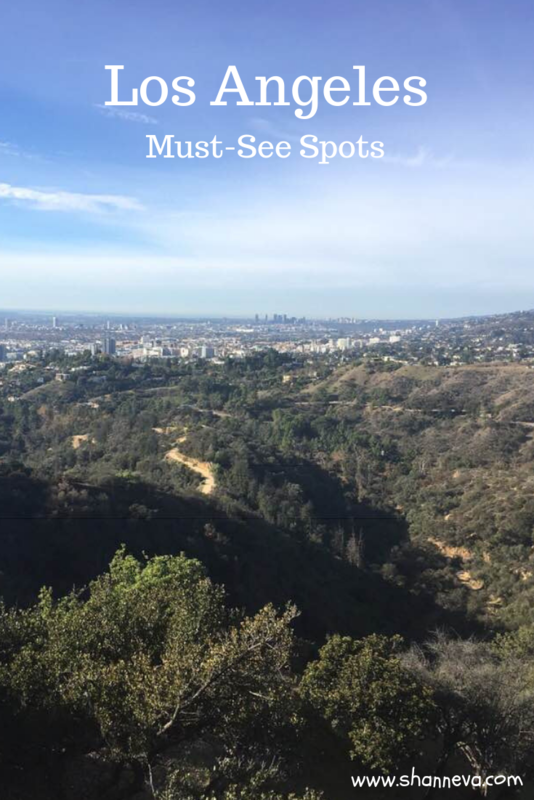 Los Angeles has so much to do and see. It must have been fun to visit your old neighborhood. Beverly Hills always looks amazing on TV (and I love that scene from Pretty Woman). When I was 15 we went on an overseas holiday and Disneyland was one of the highlights. So I’ve technically been in LA and remember it was awesome! I’ve never been to California at all, so it would be great to visit someday. Is The Griffith Observatory the one in Rebel Without a Cause? Looks like a great place to see some sights!